The intestinal mucosal CD8 T cell response to infection with Listeria monocytogenes was measured using MHC class I tetramers and was compared with the response in peripheral blood, secondary lymphoid tissue, and liver. To assess the vaccination potential of Listeria and to analyze responses in C57BL/6 mouse strains, a recombinant Listeria expressing OVA (rLM-ova) was generated. The response peaked at 9 days postinfection with a much larger fraction of the intestinal mucosa and liver CD8 T cell pool OVA specific, as compared with the spleen. However, these differences were not linked to bacterial titers in each site. The higher responses in lamina propria and liver resulted in a larger CD8 memory population in these tissues. Furthermore, the level of memory induced was dependent on infectious dose and inversely correlated with the magnitude of the recall response after oral challenge. Recall responses in the tissues were most robust in the lamina propria and liver, and reactivated Ag-specific T cells produced IFN-γ. Infection of CD40- or MHC class II-deficient mice induced poor CD8 T cell responses in the intestinal mucosa, but only partially reduced responses in the spleen and liver. Overall, the results point to novel pathways of tissue-specific regulation of primary and memory antimicrobial CD8 T cell responses. Most infectious diseases are initiated at mucosal surfaces. Bacterial and viral pathogens are efficient at penetrating or infecting mucosal epithelial cells or are able to defeat innate and mechanical mucosal defense mechanisms and cross the barrier. Once within the body, microbes have evolved further mechanisms to allow their efficient dissemination. The Gram-positive bacterium, Listeria monocytogenes, is an example of an organism that has developed sophisticated means for cellular entry and escape from destruction (1, 2). Food-borne Listeria can infect intestinal epithelial cells and spread from cell to cell without exposure to the extracellular milieu (3). Furthermore, Listeria can infect phagocytic cells and escape the phagolysosome through the activity of secreted proteins, including listeriolysin O (LLO)3 (4, 5). In this way, Listeria can be disseminated to other organs and infect other cell types, particularly in the liver and spleen (6, 7, 8). The host response against Listeria is characterized by a complex interplay between innate and adaptive immune elements (8, 9, 10, 11, 12). Neutrophils, macrophages, and NK cells producing IFN-γ play a crucial role in control of bacterial growth during the initial stage of the infection, especially in the liver (8, 13, 14). In the adaptive immune response, substantial evidence indicates that CD8 T cells are involved in the primary response and are especially important for protective immunity to secondary Listeria infections (10, 15, 16, 17). This protection is independent of IFN-γ production (18, 19) and according to some reports, but not others, does not require perforin (reviewed in Ref. 20). Thus, the mechanisms by which CD8 T cells protect against this intracellular pathogen remain to be fully defined, but could include inactivation by mediators such as TNF (21) or granulysin (22). The Listeria-specific splenic CD8 T cell response to i.v. infection in H-2Kd mice has been characterized in detail using MHC class I tetramers (23, 24). CD8 T cells specific for four epitopes from three proteins make up the great majority of the response. The immunodominant epitope is derived from the secreted protein LLO (23, 25). The response comprises ∼2% of the CD8 T cells in the spleen. A significant response to Listeria-derived N-formyl peptides restricted to the MHC class Ib molecule H2-M3 is also detectable in the spleen, but does not contribute to the recall response (26, 27). 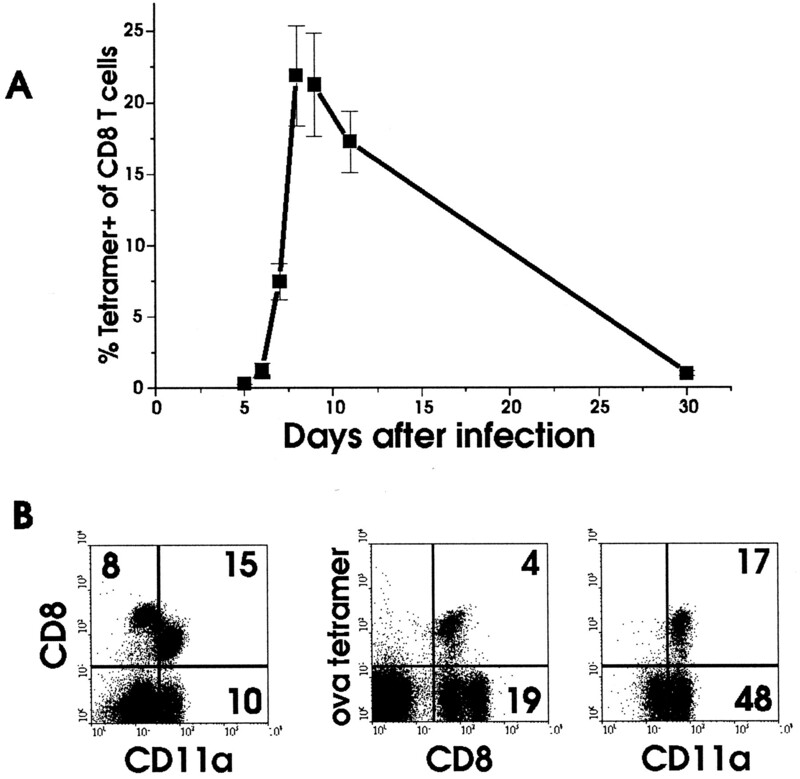 The extent of this response varies with mouse strain and represents ∼1–5% of CD8 T cells. The overall magnitude of the anti-Listeria CD8 T cell response is in contrast to some responses to viruses, such as lymphocytic choriomeningitis virus, in which >50% of splenic CD8 T cells can be Ag specific (28, 29). These differences could be due to the precursor frequency of Ag-specific T cells in different strains of mice and/or due to the nature of the infections. Surprisingly, although Listeria monocytogenes is most often an orally transmitted infection in humans, an analysis of the immune response after oral inoculation has not been performed. Moreover, quantitation of the Listeria-specific CD8 T cell response in the intestinal mucosa or the liver, regardless of route of infection, has not been measured. However, following oral infection with Listeria, it is known that intestinal intraepithelial lymphocytes (IEL), including TCRγδ cells, produce increased levels of IFN-γ after in vitro restimulation (30). Also, oral immunization with recombinant Listeria (rLM) can induce tumor regression and splenic CTL, although the mucosal response was not assessed (31). Given the fact that rLM expressing various proteins are being employed as probes for immunity and that rLM are potential vaccine candidates (32, 33, 34, 35), it is important to understand the requirements and logistics of the mucosal anti-Listeria response. Our recent results suggest that the costimulatory requirements for induction of the primary antiviral CD8 T cell response in the intestinal lamina propria (LP) and epithelium are distinct from those of secondary lymphoid CD8 T cells (36, 37). While the splenic anti-vesicular stomatitis virus (VSV) response is largely CD40 independent (37, 38), the mucosal response relies heavily on CD40-mediated events (37). Whether this finding is specific to certain pathogens or a general rule of mucosal CD8 T cell responses is unclear and requires testing, especially considering the importance of the mucosal response in vaccine design. Since natural Listeria-derived epitopes have not been identified in H-2b mice, we have employed rLM expressing OVA (rLM-ova) to allow visualization of the systemic and mucosal CD8 response in normal, MHC class II-deficient, and CD40-deficient C57BL/6 mice using H-2Kb-OVA peptide tetramers. The results demonstrated that the magnitude of the CD8 response in the liver and the mucosa outweighs that in the secondary lymphoid tissue. Significantly, the primary mucosal, but not the splenic, response was highly CD40 and CD4 T cell dependent. The concept of compartmentalization of effector and memory pools is discussed. C57BL/6J mice were purchased from The Jackson Laboratory (Bar Harbor, ME). C57BL/6-CD40−/− mice (39) were either obtained from The Jackson Laboratory or were bred in our facility from a stock generously provided by Dr. Hitoshi Kikutani (Osaka University, Osaka, Japan) via Dr. Nancy Philips (University of Massachusetts Medical Center, Worcester, MA). C57BL/6TacfBr-[KO]Abb mice (40) and age-matched controls were purchased from Taconic (Germantown, NY). A rLM (rLM-ova) was constructed that expresses a secreted form of OVA and an erythromycin-resistance marker. An Ag expression cassette was constructed that consists of the entire coding sequence of OVA fused to the signal sequence and promoter of the hly gene and an erythromycin resistance gene for selection. The Ag expression cassette was introduced into the Listeria, and double-crossed into the Listeria chromosome by homologous recombination, as previously described (32, 41). Integration of the Ag cassette into the LM genome and secretion of the OVA fusion protein by rLM-ova were confirmed by PCR and Western blot analyses, respectively. Mice were infected with rLM-ova by gavage with ∼1 × 109 CFU for primary infections and with ∼1 × 106 CFU by gavage for initial priming for recall experiments. Actual CFU were calculated following infection by plating dilutions of the inoculum. For quantitation of bacterial titers from tissues, organs were homogenized and lysed in 1% saponin and dilutions were plated on brain-heart infusion agar supplemented with 5 μg/ml erythromycin, and grown for 2 days at 37°C. At the indicated times after infection, lymphocytes were isolated and OVA-specific CD8 T cells were detected using an H-2Kb tetramer containing the OVA-derived peptide SIINFEKL (Research Genetics, Huntsville, AL) or as a negative control a Kb tetramer made with the VSV N protein-derived peptide RGYVYQGL (42). Staining with control tetramers was <0.1% in all tissues. MHC tetramers were produced essentially as previously described (28, 43). Briefly, H-2Kb containing the biotin protein ligase-dependent biotinylation substrate sequence was folded in the presence of human β2-microglobulin and peptide. Biotinylation was performed with biotin-protein ligase (Avidity, Denver, CO). Tetramers were then produced from biotinylated HPLC-purified monomers by addition of streptavidin-allophycocyanin (APC; Molecular Probes, Eugene, OR). The modified H-2Kb cDNA and the β2-microglobulin constructs were generously provided by J. Altman (Emory University, Atlanta, GA). IEL and LP cells from small intestine were isolated, as described previously (44, 45). Spleens and lymph nodes were removed, and single cell suspensions were prepared using a tissue homogenizer. The resulting preparation was filtered through Nitex nylon mesh (Tetko, Kansas City, MO) and the filtrate centrifuged to pellet the cells. To obtain lymphocytes from livers, anesthetized mice were perfused with PBS containing 75 U/ml of heparin until the tissue was cleared of blood, and the removed organ was mashed through a cell strainer (Becton Dickinson, Franklin Lakes, NJ). Hepatocytes were removed by centrifugation through 35% Percoll that contained 100 U/ml of heparin. Cells were washed and collected into a pellet for staining. Lymphocytes were resuspended in PBS/0.2% BSA/0.1% NaN3 (PBS/BSA/NaN3) at a concentration of 1 × 106 to 1 × 107 cells/ml, followed by incubation at room temperature for 1 h with OVA-tetramer-APC plus the appropriate dilution of αCD8-PE (clone 53.6.7; BD PharMingen, San Diego, CA). Cells were washed with PBS/BSA/NaN3 and stained with FITC-conjugated αCD11a (BD PharMingen) and incubated at 4°C for at least 20 min, washed again, and fixed in 3% paraformaldehyde in PBS. Relative fluorescence intensities were then measured with a FACSCalibur (Becton Dickinson, San Jose, CA). Data were analyzed using WinMDI software (Joseph Trotter, Scripps Clinic, La Jolla, CA). Statistical analysis was performed using InStat software (GraphPad). Lymphocytes were cultured in DMEM/5% FCS/10% Nu Serum (Life Technologies, Gaithersburg, MD) with added HEPES, 2-ME, and antibiotics at a density of 1 × 106 cells/ml in a 24-well plate at 37°C. To stimulate cells, cultures were treated with 1 μg/ml of SIINFEKL peptide. A total of 1 μg/ml Golgiplug (containing brefeldin A; PharMingen) was added to unstimulated and stimulated cultures. Cells were harvested after 5 h and stained with αCD8 for 30 min at 4°C. Cells were then fixed in 3% paraformaldehyde for 20 min at 4°C, washed in PBS/BSA/NaN3, and stored overnight at 4°C. The next day, the cells were permeabilized by incubating in PermWash solution (PharMingen) for 20 min, then stained with IFN-γ FITC (XMG1.2, 5 μg/ml; PharMingen) or control rat IgG1 FITC (R3-34, 5 μg/ml; PharMingen) for 30 min at 4°C. The cells were washed in PermWash solution, and the fluorescence intensity was measured on a FACSCalibur. The CD8 immune response to Listeria infection of H-2b haplotype mice has not been characterized in detail because naturally derived H-2b-restricted antigenic peptides have not been identified. Since the H-2Kb-binding peptide epitope derived from OVA is known, we produced rLM-expressing soluble OVA and analyzed the response to rLM-ova infection of C57BL/6 mice using an OVA-peptide H-2Kb tetramer. Initial experiments analyzing the PBL response showed that OVA-specific cells could be detected as early as 6 days after infection and that the response peaked at days 8–9 with ∼20% of CD8 T cells OVA specific (Fig. 1⇓). The response declined thereafter and at ∼30 days after infection memory levels were achieved. Comparison of CD11a and CD8 expression of PBL from infected mice revealed a large population of CD8lowCD11ahigh cells. CD11a is a β2 integrin that is up-regulated upon activation of CD8 T cells and remains at high expression levels on memory CD8 T cells (37). Analysis of CD8 and CD11a expression and OVA-tetramer+ cells showed that all tetramer+ cells were CD11ahighCD8low. Tetramer+ cells only made up one-fourth to one-third of the CD11ahighCD8low cells, so it is likely that Ag-specific cells reactive with other Listeria Ags were contained in this subset or that substantial nonspecific bystander activation occurred. Characterization of the peripheral blood Ag-specific CD8 T cell response to oral infection with rLM-ova. C57BL/6 mice were infected by gavage with rLM-ova, and Ag-specific CD8 T cells were quantitated by three-color flow cytometry after staining with APC-labeled H-2Kb-SIINFEKL tetramer, αCD8, and αCD11a. A, Kinetics of the anti-Listeria CD8 T cell response in PBL. Values represent means ± SE of values from at least four mice per time point. B, Flow cytometric analysis of CD8 and CD11a expression on tetramer+ cells 9 days after infection. Left and middle panels are analysis of whole, ungated PBL, and the right panel shows analysis of gated total CD8+ cells. Values represent the percentage of cells positive for the given stain. Ag-specific CD8 T cell responses were quantitated in spleen, liver, and the small intestinal LP and IEL compartments at the peak of the response (Fig. 2⇓). Before infection (Fig. 2⇓) and at 2 days postinfection (Fig. 3⇓A), no tetramer+ cells were detected in cells from any tissue. The CD11alow tetramer-staining cells in liver and spleen are inconsistently detected, and staining with tetramers containing any peptide can result in this background signal (Fig. 2⇓, top panels). Nine days after oral infection with rLM-ova, all tissues contained substantial populations of CD11ahigh OVA-specific cells (Fig. 2⇓, lower panels). As a percentage of CD8 T cells, liver (23%) and LP (19%) contained larger populations of tetramer+ cells than did the spleen (12%). Although 3.5% of total IEL were OVA specific, IEL contain populations other than CD8αβ cells, such as CD8αα and TCRγδ cells (46). 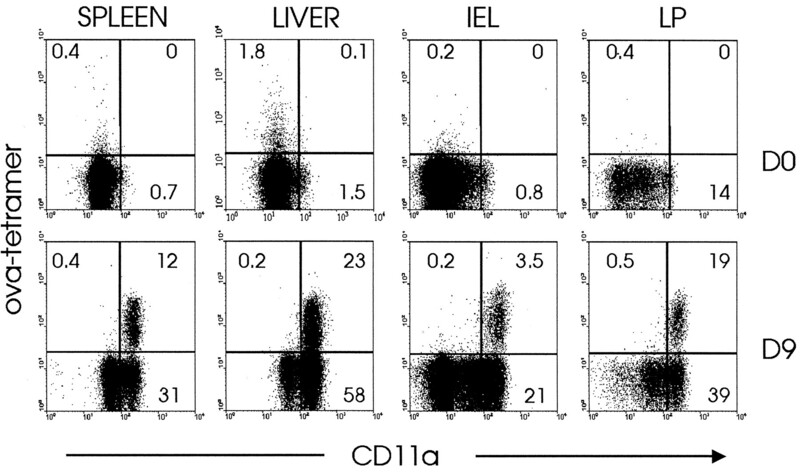 When the values are adjusted to account for only CD8αβ cells, the percentage of IEL responding within that subset is similar to that found in LP (see Fig. 3⇓). Only small numbers of Ag-specific CD8 T cells were detectable at low levels in the Peyer’s patches and mesenteric lymph nodes (MLN), despite the fact that Listeria could be detected in those sites early after infection (data not shown). CD8 T cells in liver and intestinal mucosa mount a vigorous response to Listeria infection. C57BL/6 mice were infected (or not, Day 0) with rLM-ova by gavage, and 9 days later lymphocytes isolated from spleen, liver, LP, and intestinal epithelium were stained with an APC-labeled H-2Kb-SIINFEKL tetramer, αCD8, and αCD11a, and analyzed by flow cytometry. Analysis of gated CD8+ cells is shown, and the values represent the percentage of tetramer+ cells in the CD8 population. Kinetics of the CD8 T cell anti-Listeria response and bacterial titers in spleen, liver, LP, and IEL. Mice were infected with rLM-ova by gavage, and lymphocytes were isolated from the indicated organs at the indicated days postinfection. Lymphocytes were stained with an APC-labeled H-2Kb-SIINFEKL tetramer, αCD8α, αCD8β, and αCD11a, and analyzed by flow cytometry. Values represent the means ± SEs of the percentage of tetramer+ cells among CD8αβ cells from four mice per time point (A). The total number of tetramer+ cells was calculated from tissues of four mice per time point by multiplying the percentage of tetramer+ cells by the total number of lymphocytes per tissue (B). Tissue lysates from four mice per time point were generated on the indicated days and plated on brain-heart infusion agar with erythromycin for quantitation of bacterial titers (C). Values in B and C represent means ± SEs. Analysis of the overall kinetics of the response showed that as compared with the spleen, the response in the LP was sustained for at least an additional 2 wk (Fig. 3⇑A). At 15 days after infection, when the splenic response had declined to memory levels, ∼13% of LP CD8 T cells were Ag specific. By ∼5 wk after infection, LP OVA-specific CD8 T cells had declined to memory levels. The magnitude of the peak response shown in this study is substantially greater than that reported for natural Listeria epitopes in H-2d mice (23), which may be due to strain differences and/or precursor frequencies for different Ags. The total number of tetramer-positive cells in each tissue increased up until day 9 after infection, except in liver, in which the peak number of cells was detected on day 8. The response subsequently declined, reaching memory levels at ∼15 days postinfection in spleen, LP, and IEL. In the liver, after an initial drop in Ag-specific cells on day 15, the numbers were sustained for an additional week before declining to memory levels at >day 35. This result may be linked to the variable but sustained titers of Listeria detected in the liver (Fig. 3⇑C). 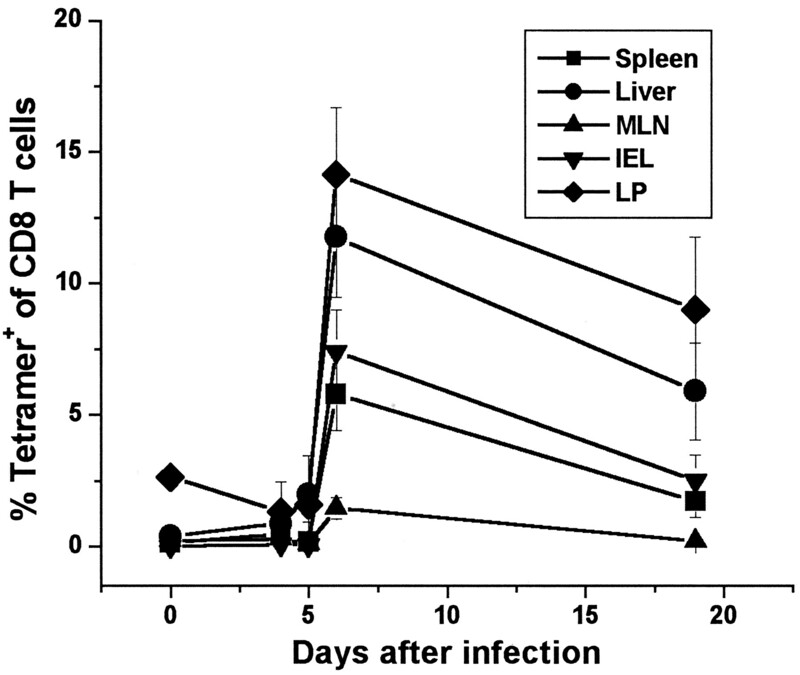 While the largest numbers of bacteria were found in the spleen, MLN, and small intestine 2 days after infection, in the liver, higher numbers of Listeria were present at 5 days after infection, and this titer gradually declined to low or undetectable at 15 days postinfection (Fig. 3⇑C). 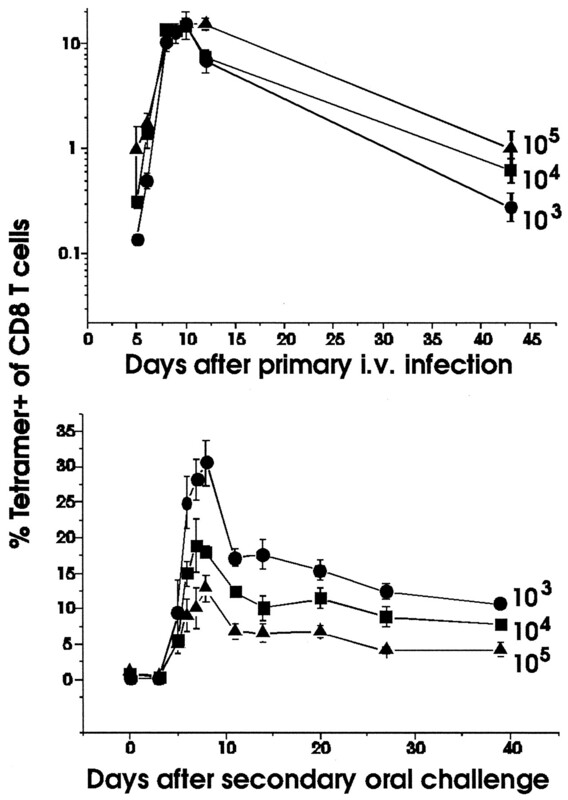 In contrast, titers in spleen, MLN, and small intestine were low or undetectable at 5 days postinfection, indicating that the peak of the CD8 T cell response in these tissues followed the clearance of bacteria. In addition, although bacterial titers were higher and more sustained in liver as compared with intestine, a larger population of tetramer+ cells was retained in the LP as compared with the liver. To determine whether oral immunization with rLM-ova could generate Ag-specific memory CD8 T cells in the liver and mucosal tissues, mice were infected and 41 days later lymphocytes were analyzed. No consistent staining in spleen (Fig. 4⇓) or other tissues (data not shown) was obtained after reaction with an irrelevant tetramer containing a VSV nucleoprotein peptide. Interestingly, as compared with spleen, more of the total CD8 T cells in LP and liver were OVA specific at 41 days after infection. 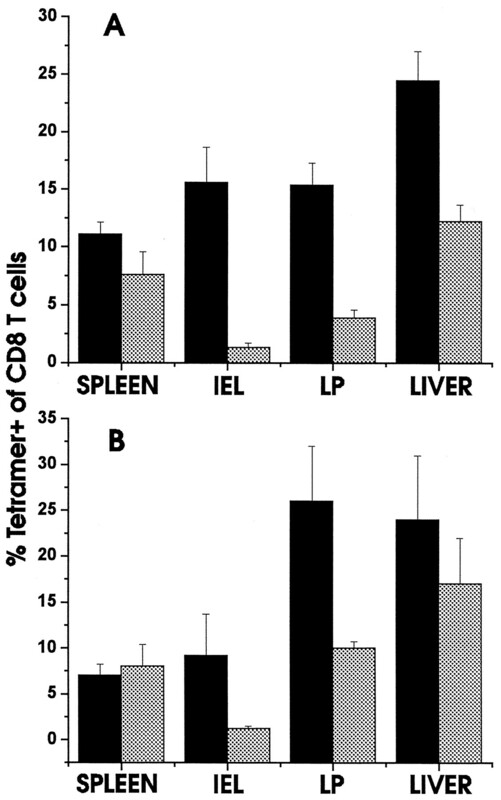 Whereas <1% of splenic CD8 T cells were OVA specific, 2.9% and 2.7% of liver and LP CD8 T cells were tetramer+ (Fig. 4⇓). Memory cells were also detectable in the intestinal epithelium with 0.5% of IEL OVA reactive. In the several experiments that were performed up to 70 days after infection, these differences between memory levels in spleen vs liver and LP were consistent and correlated with the relative magnitude of the primary response in each tissue. Oral Listeria infection induces high levels of CD8 memory T cells in liver and intestinal mucosa. Lymphocytes were isolated from spleen, liver, LP, and IEL 41 days postinfection and stained with an APC-labeled H-2Kb-SIINFEKL tetramer, αCD8, αCD8β, and αCD11a, and analyzed by flow cytometry. For comparison, staining of spleen cells with an irrelevant tetramer is shown (top panel). Analysis of gated CD8+ cells is shown, and the values represent the percentage of tetramer+ cells in the CD8 population. IEL values are of CD8β+ cells. To determine the relationship between the level of CD8 T cell memory and the magnitude of the recall response, mice were infected i.v. with graded doses of rLM-ova and CD8 memory levels were measured in PBL (Fig. 5⇓, top panel). Intravenous, rather than oral, infection was used for priming because more consistent levels of memory cells at low doses of bacteria are achieved via this route. Oral infection using high bacterial loads resulted in induction of memory, while lower doses resulted in detectable but variable memory generation (data not shown). Although the magnitude of the primary response after i.v. infection with 103, 104, or 105 Listeria was similar, increasing the dose also increased the percentage of memory cells. Thus, infection with 103 bacteria resulted in 0.2% memory CD8 T cells, while infection with 105 Listeria induced 1% memory CD8 T cells in PBL. Forty days after infection, mice were challenged via gavage with 107 rLM-ova. The resulting response was more rapid than the primary response, with 5–10% OVA-specific cells detectable 5 days after infection (Fig. 5⇓, lower panel). Interestingly, there was an inverse relationship between the priming dose and the level of expansion in the secondary response. In mice that had received 103 bacteria initially, a massive expansion of Ag-specific cells was observed, with ∼30% of CD8 T cells tetramer+ at days 7–9 after rechallenge. This response initially declined rapidly (to ∼17% at day 10), but then tetramer+ cells remained relatively constant at ∼12% of CD8 T cells in PBL until at least 40 days after secondary infection. As compared with the recall response in mice primed with 103 Listeria, the response in mice that received a high initial dose (105 bacteria) was much less robust. At the peak of the response, ∼12% of CD8 T cells were Ag specific. An intermediate dose (104 bacteria) resulted in intermediate responses compared with infection with 103 and 105 bacteria. In all cases, the magnitude of the recall response correlated with the level of secondary memory generated. One possible explanation for these findings is that higher initial memory levels rapidly limit a secondary infection, thereby reducing the Ag load and the concomitant Ag-specific T cell expansion. Magnitude of the recall response to secondary infection is inversely proportional to the initial infectious dose. C57BL/6J mice were infected i.v. with an initial dose of 1 × 103, 1 × 104, or 1 × 105 bacteria, and the PBL response was followed as indicated. Forty days after the first infection, mice were infected orally with 1 × 107 rLM-ova, and the PBL response was measured on the days indicated in the bottom graph. Lymphocytes were isolated and stained with an APC-labeled H-2Kb-SIINFEKL tetramer and αCD8 and analyzed by flow cytometry. Values represent means ± SE of values from four to eight mice per time point. Using the two-tailed Student’s t test, in the upper panel the differences between the day 41 values, and in the lower panel the differences between the values at day 9 and 40 are significantly different at p ≤ 0.05. Since oral vaccination with rLM might require boosting to maintain immunity, it was of interest to determine whether after primary oral immunization a recall response could be obtained with secondary oral challenge. In initial experiments in which mice were primed with ∼109 bacteria, we were unable to induce a recall response using the same dose (data not shown), suggesting that protection had been induced perhaps as a consequence of substantial T cell memory and the level of mucosal IgA. Therefore, mice were infected orally with 106 rLM-ova, and at least 40 days later orally challenged with 1–5 × 109 bacteria. The low priming dose of Listeria induced very low and variable memory levels that were barely detectable in spleen but could be visualized in liver and LP (Fig. 6⇓ and data not shown). Nevertheless, the OVA-specific CD8 memory T cells mounted a vigorous response upon oral challenge with rLM-ova. By day 6 after reinfection, substantial numbers of Ag-specific T cells were present in spleen, liver, IEL, and LP. As in the primary response, greater percentages of tetramer+ cells were found in LP and liver as compared with the spleen (Fig. 6⇓). The response in the MLN was meager as it was in the primary infection even with high initial doses. The recall response was not attributable to induction of a primary response since such high numbers of OVA-specific cells are never obtained this early after infection (Fig. 3⇑). Moreover, relatively large numbers of tetramer+ cells (5–10% in LP and liver) were present 19 days after secondary infection. These results indicated that following low-dose oral priming, a substantial boosting of memory CD8 T cells could be obtained in the liver and intestinal mucosa, which are sites of replication and/or entry of the bacteria. Secondary infection with rLM-ova induces a potent recall response in liver and intestinal mucosa. Mice were initially infected with 3 × 106 rLM-ova by gavage, and infected with 5 × 109 bacteria by gavage 42 days later. Lymphocytes were isolated from the various tissues at the indicated day after secondary infection and stained with an APC-labeled H-2Kb-SIINFEKL tetramer and αCD8 and analyzed by flow cytometry. Values represent means ± SE of values from four mice per time point. To assess the functional phenotype of the reactivated lymphocytes, we determined their capacity for IFN-γ production. Six days after secondary infection of primed mice when tetramer+ cells had greatly expanded in numbers (Fig. 7⇓, top panels), IFN-γ production was tested by intracellular staining (Fig. 7⇓, bottom panels). After a 5-h stimulation in vitro with the SIINFEKL peptide, a substantial population of IFN-γ-producing cells was detected among CD8 T cells from the spleen, liver, and LP. In all cases, the percentage of intracellular cytokine-producing cells correlated with the percentage of tetramer+ cells. 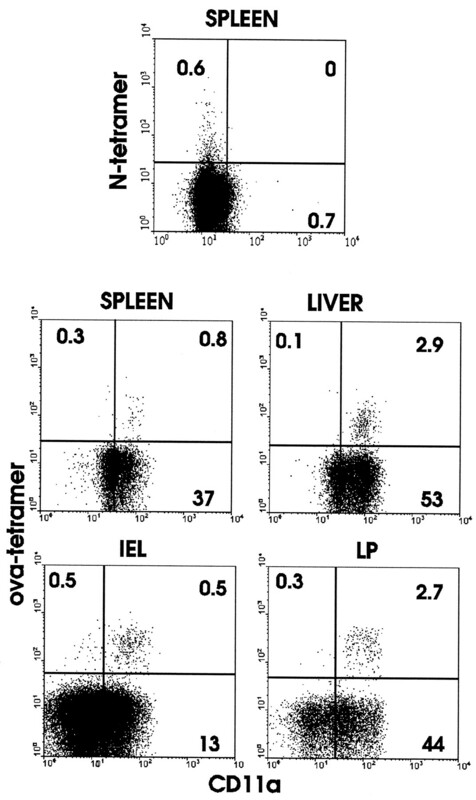 OVA-specific CD8 T cells in the primary response also produced IFN-γ, although in general fewer IFN-γ producers were detected as compared with tetramer+ cells (data not shown). In the absence of peptide, or directly ex vivo without culture, no specific staining was detected (data not shown). Reactivated Ag-specific memory cells in all tissues produce IFN-γ. Analysis of tissues from a representative mouse as described in Fig. 6⇑ is shown on day 6 after secondary infection. 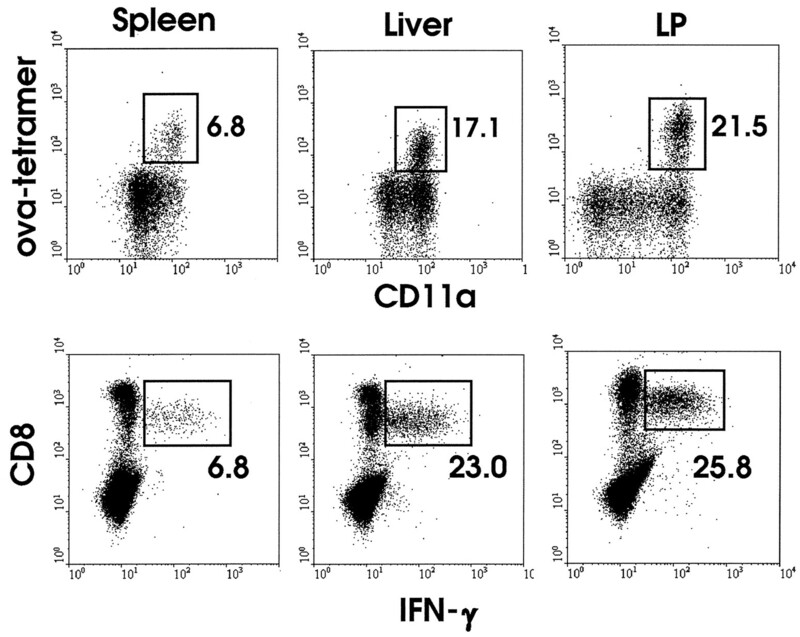 The top panel shows the percentage of tetramer+ cells of CD8+ T cells, and the bottom panel shows intracellular IFN-γ staining of CD8+ T cells from the same animal. The values in both panels represent the percentage of positive cells in the CD8+ population. Lymphocytes were isolated from the various tissues, and stained with an APC-labeled H-2Kb-SIINFEKL tetramer, αCD8, and αCD11a, and analyzed by flow cytometry or were placed in a 5-h culture with or without SIINFEKL peptide stimulation, stained for intracellular IFN-γ and CD8 expression, and analyzed by flow cytometry. Our previous results demonstrated that in the primary response to systemic VSV infection, CD40/CD40L interactions were essential for inducing an optimal mucosal CD8 T cell response, but played a less important role in the splenic response (37). To determine whether this finding represented a general rule for mucosal responses or was specific to certain infections, we tested the role of CD40 in generating OVA-specific CD8 T cells by oral rLM-ova infection of CD40-deficient mice (Fig. 8⇓A). The splenic CD8 T cell response was partially blocked (∼35%) and the liver response was inhibited ∼50% in the absence CD40. In contrast, mucosal responses in the LP and IEL compartments were inhibited by 75–90% in CD40−/− mice. Preliminary results indicated that this defect also extended to the memory phase of the response (data not shown). Intestine-specific defect in the CD8 response to Listeria infection in CD40-deficient and MHC class II-deficient mice. C57BL/6J control (▪), CD40−/− mice (A, ▦), or MHC class II−/− (B, ▦) mice were infected by gavage with rLM-ova, and lymphocytes were isolated from spleen, liver, IEL, and LP 9 days after infection. Lymphocytes were isolated from the indicated tissues and stained with an APC-labeled H-2Kb-SIINFEKL tetramer, αCD8, and αCD11a, and analyzed by flow cytometry. Values represent the means ± SEs of the percentage of tetramer+ cells among CD8αβ cells from four mice. Using the two-tailed Student’s t test, the differences between the values from CD40−/− and C57BL/6 mice (A) were significantly different at p ≤ 0.004 (IEL), p ≤ 0.0002 (liver), and p ≤ 0.02 (LP), but spleen values were not significantly different. In B, differences in LP were significantly different at p ≤ 0.04, while differences in other tissues were not significantly different. Since one way in which CD4 T cells may help CD8 T cells is via a CD40-mediated activation of APC (47, 48, 49), we examined the role of CD4 T cells in the CD8 T cell response to rLM-ova. MHC class II-deficient mice were infected and the percentage of tetramer+ cells was assessed 9 days after infection. The splenic response appeared normal and the liver response was inhibited ∼20% in the absence of MHC class II-restricted CD4 T cells. However, the number of Ag-specific CD8 T cells in the intestinal epithelium and the LP was reduced 60–75%. These results suggest that CD4 T cells may be acting in a tissue-specific manner to regulate CD8 T cell responses, perhaps via CD40L/CD40 interactions. These studies report intriguing tissue-specific differences in the CD8 T cell anti-Listeria response in C57BL/6 mice. Despite the fact that ingestion of contaminated food is the natural route of Listeria infection in normal individuals and that Listeria has been suggested as a potential vaccine vector (32, 33, 34, 35, 50), little is known about the mucosal immune response to this pathogen. We therefore undertook a comparative study of the CD8 response to oral Listeria infection in secondary lymphoid, hepatic, and small intestinal mucosa tissues. Employing a rLM-producing OVA to enable detection of OVA-specific T cells by tetramer staining, the timing, magnitude of the response to primary infection, and the generation and recall of memory were examined. As compared with previous data quantitating the CD8 response to natural epitopes of Listeria in H-2d mice, the magnitude of the anti-OVA response to rLM-ova in C57BL/6 mice was substantially greater (23). Although this may be due to differences in precursor frequency for a particular Ag, examination of CD8 levels after infection suggested otherwise. Thus, a population of CD8lowCD11ahigh tetramer-negative cells equal to or greater than the number of tetramer+ cells was detected in PBL (Fig. 1⇑) and other tissues (data not shown). While some of these cells could be nonspecifically activated, it is perhaps likely that this population contains CD8 T cells specific for as yet unidentified epitopes. One of the more interesting phenomenon we observed was the predilection for Ag-specific CD8 T cells to appear in tertiary tissues as compared with lymph nodes or spleen. The CD8 T cell pool of the intestinal LP and the liver harbored a greater concentration of Listeria-specific T cells than that of the spleen or the lymph nodes. Significantly, the magnitude of the primary response in each tissue correlated with the size of the resulting Ag-specific memory population. This was also true for tetramer-negative CD11ahigh cells whose specificity at present is unknown (compare day 0 in Fig. 2⇑ with Fig. 4⇑). This finding supported the concept that the homeostasis of the memory pool in each organ is, at least in part, independently maintained. That is, the percentage of the CD8 population that makes up the memory pool is different in each tissue: there is not a normalization of this population over time in the animal as a whole. Control of the memory populations could occur at several levels. For example, hepatic or LP memory cells could continuously recirculate through blood and spleen, but these tissues may retain a larger subset of memory cells at any one time through specialized adhesive interactions. Alternatively, part or all of the memory pool in the LP and liver could be life-long, self-sustaining residents of each tissue. In the strictest version of this scenario, each organ-specific memory subset would be separately maintained and would not intermix. Much more detailed analysis is needed to address these possibilities. The liver and the gut have been suggested to be sites in which effete CD8 T cells are preferentially removed from circulation (51, 52). In the case of influenza infection, Ag-specific CD8 T cells can be found in substantial numbers in the liver, even though the virus is thought not to replicate at that site (53). However, these cells are defective in their ability to produce IFN-γ, in the primary and secondary response (53). Increased apoptosis of CD8 cells was also observed, but it was not determined whether such cells were Ag specific. Our results did not support the contention that the liver or the intestine was involved in removal of Ag-specific cells. There was a large primary response in the liver, as well as the gut, and the extent of this response was reflected in the formation of a larger memory pool. Thus, the larger primary response in these tissues would be expected to generate higher numbers of apoptotic cells during the downswing of the response, but nevertheless also produces more memory cells. Furthermore, in our system we did not observe a functional defect in the hepatic Ag-specific CD8 T cells either in the primary (data not shown) or recall response (Fig. 7⇑). After primary i.v. infection with graded doses of Listeria and secondary oral challenge, we observed an inverse correlation between the level of memory and the magnitude of the recall response (Fig. 5⇑). Lower levels of memory resulted in a larger recall response and vice versa. An attractive explanation for this phenomenon is that a higher level of memory CD8 T cells limits the secondary infection and therefore Ag levels, and results in less T cell expansion. This theory is supported by previous reports demonstrating that CD8 T cells are important for protection against i.v. secondary Listeria infection (10, 15, 16, 17). It is also possible that the level of the Ab response, perhaps including intestinal IgA, may also correlate with the extent of primary infection. Although serum Ab to Listeria is not thought to be important in protection (54, 55), a recent paper demonstrated that i.p. infection could be inhibited with an LLO-specific mAb (56). However, no studies have directly examined the role of mucosal Ab in oral Listeria infection. The dichotomy of the anti-Listeria response in the intestinal mucosa vs secondary lymphoid tissue was exemplified by the distinctions in the requirement for CD40 costimulation and CD4 help in the different tissues. While the primary response in the spleen and liver was partially decreased in CD40−/− mice and marginally affected in MHC class II−/− mice, the intestinal response was dramatically inhibited in both cases. These results suggested that the CD40 interaction was at the level of CD4 T cells with APC, thereby decreasing CD4-mediated help for the CD8 response. This type of differential requirement for CD4 T cells and CD40 in different tissues has not been previously reported. Whether the CD4 T cells are acting on APC to promote their differentiation to allow CD8 priming or whether CD4 T cells are providing growth factors to CD8 T cells is not yet known. A direct role for CD40L expressed by CD8 T cells is also possible since we have shown that blocking CD40L on CD8 T cells inhibits the mucosal response of adoptively transferred Ag-specific CD8 T cells (37). Our studies with VSV infection of CD40−/− mice did show similar effects of CD40 absence in the gut vs the spleen (37), and preliminary results suggest that CD4 T cells are also required. Thus, the requirement for intestine-specific regulation of the CD8 response may be a general rule. Further analysis of the cellular and cytokine components of the mucosal response as well as analysis of other types of immune responses will be needed to elucidate the underlying regulatory mechanism. ↵1 This work was supported by U.S. Public Health Service Grants AI41576 and DK57932 (to L.L.) and AI45025 (to H.S.). A.M. was supported by a collaborative grant from the Edward Jenner Institute for Vaccine Research. 3 Abbreviations used in this paper: LLO, listeriolysin O; APC, allophycocyanin; IEL, intraepithelial lymphocyte; LP, lamina propria; MLN, mesenteric lymph node; rLM, recombinant Listeria; rLM-ova, rLM expressing OVA; VSV, vesicular stomatitis virus.